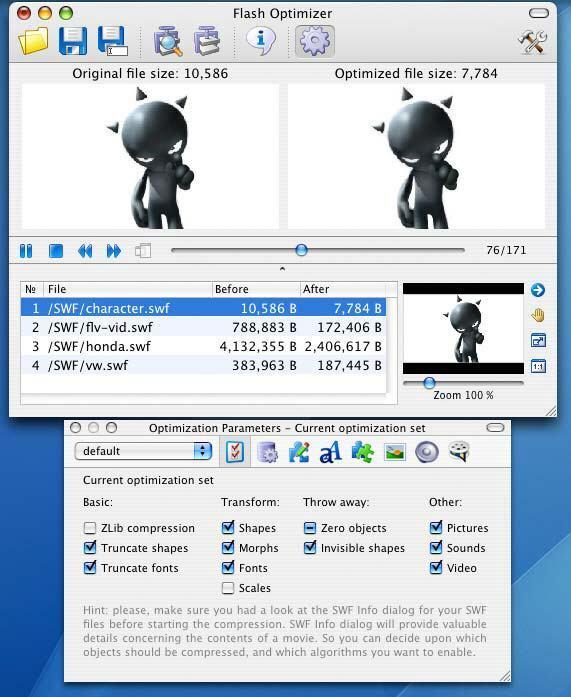 A powerful, feature-rich SWF compression utility which easily reduces SWF files size up to 80%. Flash® delivers the most progressive interactive Internet solution which produces quality, vivid and low-bandwidth animation. At the same time, everyone who uses Flash at their websites and everyday work feel a need to save loading time, traffic and server space. This is where Flash Optimizer can be of great help. Flash Optimizer uses a series of mathematic methods to optimize the output format of Flash. The main purpose of such optimization is to compress Flash files with the least quality loss and optimize them for faster download. In web terms it is speed, interactivity, reliability and quality. Flash Optimizer manages to dramatically compress SWF files up to 60-70% as it offers total control over each and every optimization option. This allows you to reach the most effective compression specifically for your Flash files. With a few clicks of mouse you will reduce the file size twice or even more. Now, is it worth that? Such amazing compression is possible, why not use it? Flash Optimizer is the right software to reduce your website size (and server load in turn) and easily increase your profits. Flash Optimizer for Mac is a powerful, feature-rich SWF compression utility which can dramatically compress SWF files up to 60-70%. Internet Cleanup Mac - Detect and Eliminate Spyware, protect your Mac and personal Information, selectively Block FLASH Ads, sort and toss Unwelcome Email Attachments, and more.